The world has been waiting for a classic good-time rock’n’roll band ever since the Black Crowes abdicated the throne a few years ago. There have been countless contenders and pretenders, from Blackberry Smoke to former Crowes guitarist Rich Robinson’s The Magpie Salute. But not one of them has managed to seize the crown yet. Blackwater Conspiracy are the latest band with their eyes on the prize. This ain’t the County Tyrone band’s first rodeo – they peddled heads-down AC/DC-ish rock’n’roll under the name Million Dollar Reload until changing their name and sound literally halfway through a show a couple of years ago. The new name isn’t much better than the old one, but the music definitely is. Opening your album with a strutting, peacocking tune called Blackwater Swagger is a bold statement of intent. But it’s ’85 Rock Star that best encapsulates their manifesto, even if ’75 Rock Star would be a more accurate title. ‘Live fast, leave something beautiful,’ rasps singer Phil Conalane, like Chris Robinson doing his best Bon Scott impression. 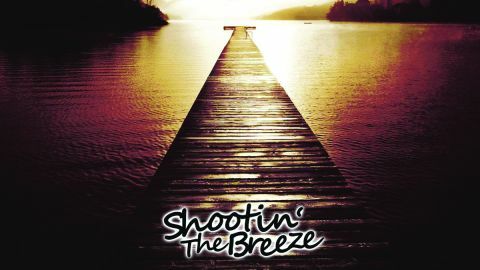 Let’s not be under any illusions: from its title down, there’s not a shred of originality on Shootin’ The Breeze. You can trace the low-slung guitars of Monday Club and Roll The Dice back to the Faces and Exile-era Stones, and the good-time piano that rinky-tinks its way through all 11 tracks hark back to every American barroom ever. And when Conalane rasps, ‘It’s like a four-leaf clover, it’s like a perfect moon,’ or sings about shootin’ the breeze until the morning sun on the title track, somewhere the Cliché Police are dropping their doughnuts and rushing to their squad cars. But quality trumps originality every time, and Blackwater Conspiracy are nailed on in that department. The inferiority complex that kneecaps so many bands from this side of the Atlantic is nowhere to be heard: it takes brass balls to title a slow-burning mini-epic President Joe when the closest you come to America is watching repeats of CSI: Miami on Channel 5 USA. But then all the greatest rock’n’roll bands have never truly been about authenticity – just ask the Rolling Stones. Of course, Blackwater Conspiracy have a long way to go before they touch the hem of the Stones’ greatness. Hell, right now they’re somewhere below the Counterfeit Stones in the pecking order. But you’re unlikely to hear a better straight-ahead rock’n’roll record this year than Shootin’ The Breeze, clichés be damned.